A professionally written, edited, and perfect-bound softcover training manual. Aligned to the PMBOK® Guide 6th Edition, this book adds insights, context, and case studies not found in other PMP test prep books and eliminates the need to purchase the PMBOK Guide. The PM Master PrepTM training slides are highly aligned to both the PMBOK Guide 6th Edition and our hardcover training manual. You won't find any inconsistencies in message or delivery throughout our product suite. Instructors get the .pptx files and students get the .pdf files. Our online system has 10 Knowledge Area practice tests, 5 Process Group practice tests and our PMP Exam Simulator. 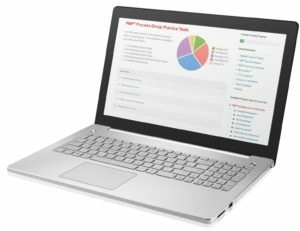 With a pool of 1,400 questions, our PMP Exam Simulator randomly delivers 200 PMP test questions proportionally by Process Group as detailed in PMI's Exam Content Outline. Online resources make the process of PMP exam prep extremely effective. Our I.T.T.O. InspectorTM and PM One-ViewTM are reveal modals that provide the easiest way to access definitions and recognize where in the big picture you are. Other resources are our Formulas & Calculations, Case Study videos, Forum and Glossary.